ARE YOU LOOKING FOR A 100% POST-CONSUMER RECYCLED PRODUCT? We stock Jelly Bean Glass®, Crushed Bottles, and Crushed Plate Glass. Jelly Bean Glass® is made from 100% post-consumer glass. It is offered in NTMA sizes #0, 1, 2, and 3, and 13 colors. Jelly Bean Glass® is shipped in 5-lb, 25-lb, and 50-lb bags. 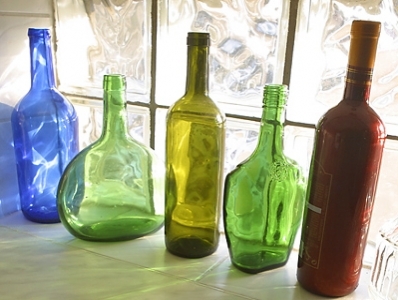 Crushed Bottles are available in amber, green, clear, and mixed (a combination of all three). At times blue may be available, call for information. Crushed Plate Glass is clear with a gray or green tint. Crushed Bottles and Crushed Plate Glass have a machine-formed flat side. They can be crushed to any size from 16-100 to 3 and are shipped in 25-lb, 50-lb, and 3000-lb super sacks. We also stock 100% post-industrial Crushed Mirror. Crushed Bottles, Crushed Plate Glass, and Crushed Mirror are an economical way to incorporate recycled products into your projects. Contact us for prices and availability or look in our online store. Did you know that using recycled glass aggregate in your terrazzo projects may contribute to LEED® certification? Only the U.S. Green Building Council can award LEED® Certification. For more information, go to www.usgbc.org. Heritage Glass, Inc. and Ken Thornley, vice president, were presented with the Thomas A. Martin Utah Recycler of the Year Award for 2009 by the Recycling Coalition of Utah (RCU). The RCU is committed to increasing and improving recycling, conservation, and solid waste reduction in Utah. The Recycler of the Year Award is presented to individuals and companies for their outstanding contributions to recycling in the state.